Heavens to Betsy! ...the exclamations of a small town girl: Where's George? Today is St Georges day and I felt it shouldn't go unmentioned as this was once a great celebration in England, our equivelant of St Patricks day in Ireland and Burns night in Scotland. Except somewhere along the way it's lost it's meaning and isn't as well celebrated as perhaps it should be. Driving through town today I did see bunting outside a couple of shops but not really the mass celebration I'd hoped for. Maybe there will be some more things happening over the weekend. Some towns are holding street fairs and reinactments of the dragon being slayed. I'll keep you posted if I spot anything. 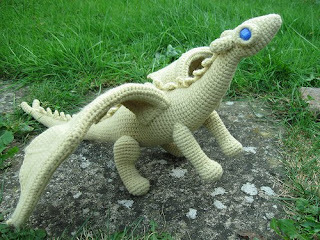 In the mean time here's a lovely crochet dragon I found made by Lucy Ravenscar. Cute! She makes all sorts of wonderful crochet creatures, blogs and is happy to share her patterns with her readers. The Owls and Miss Pussycat!